I'm a new generation entrepreneur. I follow my bliss, which led me to create Silverback Social. We're a digital marketing agency. We focus on digital marketing strategy, online reputation, and social media influencer marketing. We execute social media initiatives to help our brand partners reach their clients. We also execute search engine marketing, media marketing strategy, and manage all of our brand partners social media platforms. I create things. In 2012 when I identified a problem that there was no major digital summit in Westchester, NY I produced one. A year later Forbes named it one of the "Four Lesser-Known Conferences That Deserve Your Attention in 2013," in 2014 they named it one of the "Must-Attend Marketing Conferences For Leaders In 2014." In 2015 Forbes named us one of the "Conferences That Will Keep You Ahead Of Marketing Trends This Year." I have big ideas. 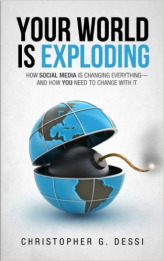 I wrote a leading social media book titled "Your World is Exploding: How Social Media is Changing Everything - and How you Need to Change with it." It shot to #1 on Amazon’s “hot new releases” in its first two weeks - all by using social channels to get the word out. People trust my opinion and respect my social media presence. As a result, I regularly appear on CNBC, CNN, Fox News, Good Day New York, & FOX BUSINESS's Varney &Co. I've been quoted in Mashable, & have lectured to the United States Marines aboard the Intrepid Sea Air & Space Museum.I'm also one of the featured bloggers on Social Media Today. I find joy in teaching. I keynote conferences & love helping people realize how powerful social media can be to generate awareness & sales through social media channels. I've spoken to executives at the Philadelphia Eagles Partner Summit. I believe in myself. I was selected by the Business Council of Westchester’s 40 under 40, because I nominated myself. Seriously. This lighter "Facebookification" of content didn't happen overnight. It's been a gradual progression of cultural acceptance and norms. When looking for inspiration on how to make a great first impression, I need to look no further than the NY Yankee legend, Derek Jeter, whom I had the opportunity to meet. Three years ago Jane West was a mid-level corporate manager, housewife and mother of two. Today West is sparking a movement and building a cannabis empire. Certain popular business books, when interpreted incorrectly can backfire in serious ways. Here are four great reasons to trash three iconic business books, and what I recommend instead. ANR Alpha Natural Resources Inc.
APL Atlas Pipeline Partners L.P.
ARR Armour Residential REIT Inc.
BK Bank of New York Mellon Corp.
CBL CBL & Associates Properties Inc.
CF CF Industries Holdings Inc.
ETP Energy Transfer Partners L.P.
LEG Leggett & Platt Inc.
MWE MarkWest Energy Partners L.P.
PAA Plains All American Pipeline L.P.
PM Philip Morris International Inc.
SQM Sociedad Qumica y Minera de Chile S.A.
VAR Varian Medical Systems Inc.
YZC Yanzhou Coal Mining Co. Ltd.
We all want positive change in our lives. We seek to succeed, and to break free from the doldrums of the everyday rat race. So how can we buckle down and shock ourselves into the change we need? FitReserve is the premier multi-studio fitness membership that allows you to mix and match workouts and choose from over 8,500 classes across a curated selection of 100+ top studios in NYC, at over 50% off retail. FitReserve provides access to full studio schedules (including peak class times), plus access to exclusive insider studio and partner perks, special events and more. The Baltimore Digital Summit was the first foray for Silverback Social into a new city. Silverback has a history of curating top executives and change agents in the digital media landscape for our events and Baltimore was no different. David S. Kidder keynoted the event, and we welcome speakers from Verizon, Rebelmouse, The Huffington Post, Legendary Pictures, the Baltimore Ravens, Comedy Central, Agency MRY, Bigfuel to name a few. Our mission is to create spine-tingling interactions between our client’s and their customers. Yes, it’s as much fun as it sounds. Last year we grew close to 3,000% and I don’t see us slowing down anytime soon. We work with everyone from global non profits to major hollywood movie studios. In 2015 Forbes named us one of the "Conferences That Will Keep You Ahead Of Marketing Trends This Year." Key power digital executives are drawn to the posh Westchester surroundings, and entrepreneurs are energized by access to the greatest minds in tech. The summit is a premium not to be missed event. Produced for the discerning senior digital executive in the New York Metropolitan area. F# connects brands to consumers through the power of music in purposeful ads using social media platforms such as Spotify & Facebook. F# has worked with leading Fortune 500 brands to deliver some of the highest engagement rates in the industry. Brands and agencies choose F# because we design ads differently. Our platform provides brand-supported experiences that reward consumers. Your personal information is all over the Internet, and it’s shaping the perception others have of you. Qnary empowers you to take control of that data, put the true you on display online, and benefit from your personal information. Social Media Today is an independent, online community for professionals in PR, marketing, advertising, or any other discipline where a thorough understanding of social media is mission-critical. Every day, we provide insight and host lively debate about the tools, platforms, companies and personalities that are revolutionizing the way we consume information. SocialMediaToday.com is published by Social Media Today LLC. ChristopherDessi.com is my blog. I write from the heart. Sometimes I write about social media, other times I just tell stories that inspire me. It depends on which mood hits me. Come swing by, and share your story. I like stories. Drive Action Digital combines the art of Social Media with the Science of Search Engine Marketing to produce the perfect storm for your brand. Touching your customer at each phase in the purchase funnel. We bring a fresh approach to an old idea: Service, engage with, and delight your customer. zanox is the leading performance advertising network in Europe. Together with the partner companies, Affiliate Window, M4N and eprofessional, zanox supports more than 3,800 international advertising customers in the effective marketing of products and services in the internet.